Of all of the music press' sales tactics that have been prominently seen through the past decade, I'm going to stick my neck out and say that the hyping up of bands, only to knock them down again has got to be the worst. There's been too many brilliant bands who have fallen victim to this for me to name them all but it has to be said that stellastarr* have suffered most. Their self-titled first record was warmly received, not least by the NME. Rightly so, as far as I'm concerned and on the back of it's release they managed to bag a support slot with the Red Hot Chili Peppers and make something of a name for themselves. Their second album, which we now concern ourselves with, was released in America a few months before we got it over on these shores and as I was going through a period of enjoying stellastarr* at the time I imported Harmonies For The Haunted. Having lived with the album for a few gloomy winter months I was horrified by the slating that NME gave it when it hit the UK in March. OK, in honesty it may not be as good as the second Interpol record, which was released only a couple of months before hand and probably suffered thusly. 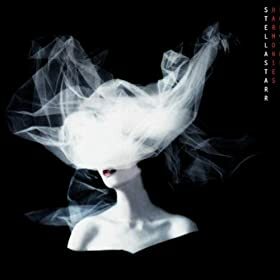 Still, the record buzzed with a excellently executed take on gloom-rock, bassist Amanda's angelic backing vocals giving it a unique slant and the songs proving the title correct. Harmonies For The Haunted not only had a plethora of great songs but provided the basis for many a band that NME would later go on to champion (Editors, White Lies). Since then stellastarr* have all but disappeared. Their third album seems to be out in the US but there's been no fanfare over it and seemingly no plans to release it in the UK. The real tragedy here however is that on this album there's some fantastic songs, namely single 'Sweet Troubled Soul' and my favourite 'Love And Longing', that simply haven't been heard by anywhere near enough people.